$19.104 million on 3020 screens. Most romantic comedies focus on characters in the same age range. 2011’s Crazy, Stupid, Love takes a different approach, as it examines amore across a few generations. After more than two decades of marriage, Emily Weaver (Julianne Moore) decides to divorce her husband Cal (Steve Carell). This comes on the heels of Emily’s affair with her co-worker David Lindhager (Kevin Bacon), but that fling was more of a symptom of the Weavers’ marital malaise than a cause for Emily’s departure. Emily’s decision comes out of nowhere to Cal and hits him hard. Sad and adrift, he encounters a relentless ladies man named Jacob Palmer (Ryan Gosling). Jacob views Cal as a pathetic sad sack who’s lost touch with his masculinity. 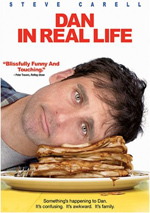 Jacob takes pity on Cal and teaches him the tricks of the trade to allow him to reconnect with his manhood and move past the end of his marriage – all while Cal really just wants to get back with Emily. In the meantime, Jacob meets Hannah (Emma Stone) at the bar. Unlike virtually every other woman he meets, Hannah resists Jacob’s charms. Instead, she dates safe, dorky Richard (Josh Groban). She thinks this leads toward marriage, but she believes this incorrectly. When the proposal Hannah expects goes awry, she bolts and heads straight to Jacob to sow some wild oats. This leads to a relationship that surprises both of them. A third plot follows Cal and Emily’s 13-year-old son Robbie (Jonah Bobo). 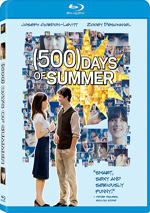 Despite his young age, he thinks he loves his 17-year-old babysitter Jessica (Analeigh Tipton). Of course, she doesn’t return that affection, partially due to the boy’s age, but also because she thinks she’s in love with Cal. Many complications ensue along the way. Every movie viewer needs to deal with the suspension of disbelief. Films often throw outlandish concept at us, so we need to decide what we’ll accept and what we’ll reject. Personally, I find it much easier to suspend disbelief when I see a flick that clearly exists in a fantasy world. Does Armageddon come with extensive leaps of logic? Sure, but who cares? It’s a stupid action movie about a killer space rock – I can live with ridiculous moments as long as I feel entertained. Crazy creates bigger issues for me because of the manner in which it pits logic against entertainment. Do I think the film boasts decent to good watchability and entertainment value? Sure. It’s too long and could easily lose at least 15 minutes, but it remains enjoyable for the majority of its running time. However, it throws a myriad of illogical moments at the viewer, and these create a significant distraction along the way. Crazy threatened to lose me when we got wind of Richard’s apparent promise of a proposal. Hannah just finished law school and would soon take the bar. Richard promises to ask an important question if she passes the test. Note the use of the world “if”. I won’t claim to boast great understanding of the female mind, but I do believe this: no woman – especially not a smart, insightful one like Hannah – will respond positively to a mate who makes their wedding engagement contingent on an achievement such as passing the bar. Why in the world would the future of their relationship depend on this? Even if we accept that Richard will only marry a woman who reaches a certain level of career success, why would Hannah put up with this? I think most women would tell the guy where to stick his proposal. That’s strike one in terms of logic, and Crazy falters many more times along the way. Crazy comes across like a poorly—run scientific experiment. A bad researcher will come up with a conclusion and adapt the “facts” to fit the desired ending. We find this in effect during Crazy. I get the impression that the filmmakers thought up the movie’s conclusion and forced all the square pegs into the round holes. This creates a tale in which characters act strangely just to fit various gags or story points. The leaps of logic reach an absurd extreme during the movie’s comedic climax. I won’t say much about this as any real discussion would provide potential spoilers, but let’s just say that the sequence pushes the bounds of storytelling sanity to an extreme. Crazy also suffers from a muddled narrative. It throws three distinct character plots at us, and that number could go up to six depending on how you separate them. I viewed “Cal/Emily”, “Jacob/Hannah” and “Robbie/Jessica” as the three threads, but you could easily split up each of those pairs and interpret them as separate arcs. However you divide up the parts, the movie fails to follow them in a consistent manner. When a film involves so many semi-lead characters, it runs risks related to the manner in which it keeps us with all of them. A well-constructed script finds a way to balance the roles and ensure that we don’t lose track of any of them for too long. Crazy lacks a well-constructed script. Not only does it come with all the absurd leaps of logic I already noted, but also it leaves too many of the six main characters off-screen for too long. Much of the first act sticks with Cal, so the others suffer. Eventually we don’t spend much time with Cal, so he suffers. This goes on and on until the film tries to wrap things up in its semi-neat bow, but the lack of balance leaves us less involved in the different characters. The question becomes whether or not you feel entertained enough by Crazy to forgive these significant cinematic flaws. As I noted earlier, yeah, I do think it boasts enough enjoyment value to let me sort of kind of almost ignore its problems. To be sure, it comes with a stellar cast, and all of them provide quite nice work. They allow their characters to grow and develop in a natural way; indeed, the actors help minimize many of the problems I mentioned, as their performances make the parts seem more believable and real despite all the idiocy in which they’re forced to participate. All of this leaves Crazy as a tough call. The critic in me doesn’t like it, as I see too many poor choices and lapses in filmmaking. The dopey Friday night moviegoer in me thinks it’s not that bad, though, and can find some entertainment value in it despite the stupidity. The movie will probably frustrate you, but you’ll still find some fun along the way. Crazy, Stupid, Love appears in an aspect ratio of approximately 2.40:1 on this Blu-ray Disc. The movie offered a good but not great transfer. Sharpness was usually strong. A few shots appeared a little on the soft side, but those instances remained rare. Instead, the majority of the flick looked accurate and well-defined. No issues with jagged edges or moiré effects occurred, and edge enhancement remained absent. Source flaws were also a non-factor; other than some light, natural grain, the movie was clean and fresh. Day went with a pretty natural palette, though it tended toward the subdued side of the street. Nonetheless, the colors remained full and well-defined. Blacks were reasonably dark and tight, but shadows tended to be a bit dull. Low-light shots veered toward the slightly dense side and lacked great definition. Neither that side of things nor the mild softness created substantial concerns, but they knocked my grade down to a “B”. Expect a perfectly ordinary DTS-HD MA 5.1 soundtrack from Crazy. The film offered some light environmental information and decent stereo music but not much more. The soundscape was used best during bar scenes, as those featured the five channels in a moderately satisfying way. Otherwise, I’d be hard-pressed to specify other sequences that bothered to feature the surrounds; this was a decidedly low-key sonic affair. Audio quality was fine. Speech was natural and crisp, without edginess or other issues. Music appeared fairly full and rich, while effects showed good clarity and accuracy. All of this was perfectly adequate for a romantic comedy. Only a few extras pop up here. Steve and Ryan Walk Into a Bar gives us a six-minute, 40-second featurette. Actors Steve Carell and Ryan Gosling chat on the set as they discuss aspects of the flick, their characters and other elements. It’s an amusing piece but not particularly informative. The Player Meets His Match runs five minutes, 40 seconds and features Gosling, Carell, and actor Emma Stone. They provide some thoughts on the movie’s story and characters. Like “Bar”, it has a few decent moments but lacks substance. 14 Deleted Scenes fill a total of 12 minutes, 27 seconds. We get “Hannah and Liz Discuss Richard”, “Liz Propositions Jacob”, “Apartment Hunting”, “A Bathroom Conversation”, “Sage Advice”, “No One Laughed At This Joke”, “Jacob’s Patter”, “Jacob ‘Helps’ Cal”, “Sexting Her Patience”, “Toner Issues”, “Long Legs”, “TV Junkie”, “Lowe’s Is a Many-Splendored Thing”, and “Alternate Ending”. Given that 14 scenes average less than a minute apiece, you shouldn’t expect much from these. No significant story elements pop here, as the vast majority of the snippets exist for comedic value. Some are enjoyable, but given the movie’s already sluggish pacing, I’m glad they got the boot; this is not a film that needs to be longer. The disc opens with ads for Happy Feet Two and Sherlock Holmes: A Game of Shadows. No trailer for Crazy pops up here. A second platter provides both a digital copy of Crazy for use on computers or digital portable gadgets as well as a DVD copy of the film. This delivers a barebones package, so don’t expect any extras. 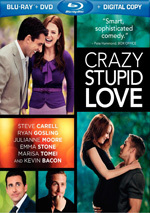 Crazy, Stupid, Love takes an excellent cast and puts them to decent use. However, it runs too long and involves too muddled a story to really succeed; it’s entertaining but flawed. The Blu-ray comes with reasonably good picture and audio but skimps on supplements. This makes for passable date night fare.